Between September 1963 and January 1965, The Sherwoods appeared regularly at Solihull Civic Hall as principal support band to The Applejacks who soared up the British charts with their hit record Tell Me When. They also deputised for the increasingly busy Applejacks as backing band to Christine Holmes (birth name Christine Hodgson) who later performed under the name Christine Sparkle. Christine subsequently went on to appear in London’s West End with Derek Nimmo in the hit musical Charlie Girl. The Sherwoods were managed by former show biz photographer Harry Hammond who also had under his wing folk trio The Overlanders who made it to the top of the charts in 1966 with Michelle. 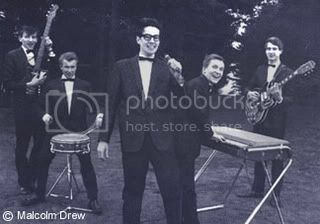 In the summer of 1964 The Sherwoods went down to London and recorded some songs of which Some Other Time (composed by Terry Widlake) backed with Memories (composed by Malcolm Drew) was released as a single on the Solar Records label. The Daily Sketch on 5th August 1964 reported that Solar Records was launched by Jeff Smith, 21 of Willesden. Other bands on the label included “Gerry James and The Bandits”, “The Rainchecks” and “Bobby Allison” (formerly of The Allisons). Despite its commercial appeal, The Sherwoods single did not chart, but there were still plenty of bookings for the band who soon embarked on their first tour of Germany. Due to work commitments, keyboard player Roy Silvester was replaced by Alan George. Upon their return from Germany in September 1964, The Sherwoods continued to tour throughout the Midlands. Their bookings included return visits to Solihullâ€™s Civic Hall and weekly appearances in cabaret at Birminghamâ€™s prestigious La Reserve Club where they supported amongst others, veteran radio star Jack Train (Radio Show I.T.M.A.) and comedian Bill Pertwee (later of Dad’s Army fame). The Sherwoods returned to Germany in January 1965, adding female vocalist Liz Comber (who lived next door to the late TV personality Leslie Crowther) to their line up. On an extended tour of the freezing north of Germany they shared the stage with amongst others, Johnny Kidd & The Pirates, Davy Jones, and King Size Taylor & the Dominoes. In March the Sherwoods became resident band at the Schleihalle Club in Schleswig Holstein and continued to draw crowds there until they returned to the UK in May 1965. Personal and artistic differences had blighted the group for some time and immediately upon their return to England, Malcolm Drew left the band. He went to Sweden where he joined his brother Roger, in the very popular (in Sweden) folk group The Coachmen. They recorded Seasons In The Sun / Gabrielle for Columbia Records (DB8057) in 1966. Terry Widlake together with drummer Dave Walsh joined previously mentioned folk trio The Overlanders “beefing up” their sound for tour dates. Terry subsequently worked with Cuppa-T, the Art Movement and the “Big 0” – Roy Orbison. Lead guitarist Peter Weaving left the band a few months later and within a year The Sherwoods had disbanded. Apart from The Sherwoods only record release Some Other Time, unreleased studio recordings penned by group members included Whoâ€™s Gonna Know, Please Leave Me Alone and If You Dream. Also in the personal archives of co-founder Malcolm Drew, are privately made recordings of the band performing live in the 60’s at the Schleihalle – Germany, The Royal Oak – Solihull, and La Reserve in Birmingham. Malcolm now lives in Spain where he works regularly as a singer and karaoke presenter. Hallo i remember The Sherwoods in Schleswig. Good to hear from you. We were good friends. Hope you are keeping well. I have added several videos of The Sherwoods on http://www.youtube.com. Search “The Sherwoods Story” and also click on “malcolm drew” to locate the other videos. Regards, Malcolm Drew – Spain. Gut, von Ihnen zu hören. Wir waren gute Freunde. Hoffe, Sie sind gut zu halten. Ich habe mehrere Videos von den Sherwoods auf http://www.youtube.com aufgenommen. Suche nach “The Sherwoods Story” und auch auf “malcolm drew”, um die anderen Videos suchen. Regards, Malcolm Drew – Spanien. habe erst heute Deine Antwort auf der Seite Birmingham Music Archiv gelesen 🙁 ! Zeitreise. War doch eine schöne Zeit! Leider schon so lange her, doch es ist sehr schön wenn man die Zeit ein wenig zurückholen kann. Wenn ich in Schleswig bin denke ich oft an die Zeit in der Schleihalle. Leider gibt es die Schleihalle nicht mehr, man hat sie abgerissen. Fußballfan und reise viel mit meinem Verein durch Deutschland. Nun wünsche ich Dir und Deiner Familie alles Gute. Hello malcolm i hope you can help me. Im looking for an email adress for Rob Sowton the bass player in your group the swell harmony band. Can you help me??? My father used to play in a band with him called ground pepper in the midlands in the early 70s and hasnt seen them since it would be nice to reconnect them. Thanks Jon Perrin.